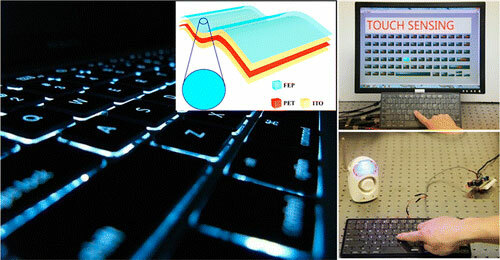 (Nanowerk News) In a novel twist in cybersecurity, scientists have developed a self-cleaning, self-powered smart keyboard that can identify computer users by the way they type. The device, reported in the journal ACS Nano ("Personalized Keystroke Dynamics for Self-Powered Human–Machine Interfacing"), could help prevent unauthorized users from gaining direct access to computers. Zhong Lin Wang and colleagues note that password protection is one of the most common ways we control who can log onto our computers — and see the private information we entrust to them. But as many recent high-profile stories about hacking and fraud have demonstrated, passwords are themselves vulnerable to theft. So Wang’s team set out to find a more secure but still cost-effective and user-friendly approach to safeguarding what’s on our computers. The researchers developed a smart keyboard that can sense typing patterns — including the pressure applied to keys and speed — that can accurately distinguish one individual user from another. So even if someone knows your password, he or she cannot access your computer because that person types in a different way than you would. It also can harness the energy generated from typing to either power itself or another small device. And the special surface coating repels dirt and grime. The scientists conclude that the keyboard could provide an additional layer of protection to boost the security of our computer systems.